Are you looking for the chance to break out of your normal routine, do something different, for one weekend a month and two weeks per year? Would you like to be an important member of a winning team? Do you want to earn cash and benefits while you participate in a challenging and rewarding part-time job? Would you like to serve your community, state and country? Are you looking for a way to obtain money and tuition assistance to continue your education? Can you picture yourself in photographs such as these? These are not recruiting pictures, they are photographs of actual Bravo Troop Soldiers participating in interesting, fun and exciting training. 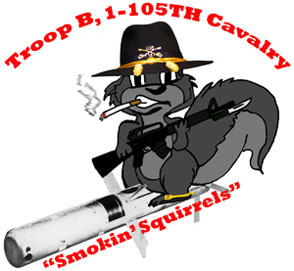 If you answer YES to any of these questions, then . . .
. . . Bravo Troop, 1-105TH Cavalry, has opportunities for you! Cash: sign-up bonuses, monthly drill pay, promotion, raises, and re-enlistment bonuses! Education: such as the Montgomery GI Bill and Wisconsin's 100% College Tuition Reimbursement, among others! Adventure: do exciting things you may not have done before, sometimes in places you have never been before! Camaraderie: meet and work with interesting people from throughout the state and from all walks of life! Travel: low cost Space Available flights! You can find more official information about joining the Army National Guard by clicking this link. Follow these links to navigate throughout the rest of Bravo Troop's web site to find out more about who we are and what we do! Do you want more information about how to become a member of Bravo Troop? Do you need more information about the opportunities and benefits available to you if you become a member of Bravo Troop? Call our unit recruiter at (920) 262-1562.